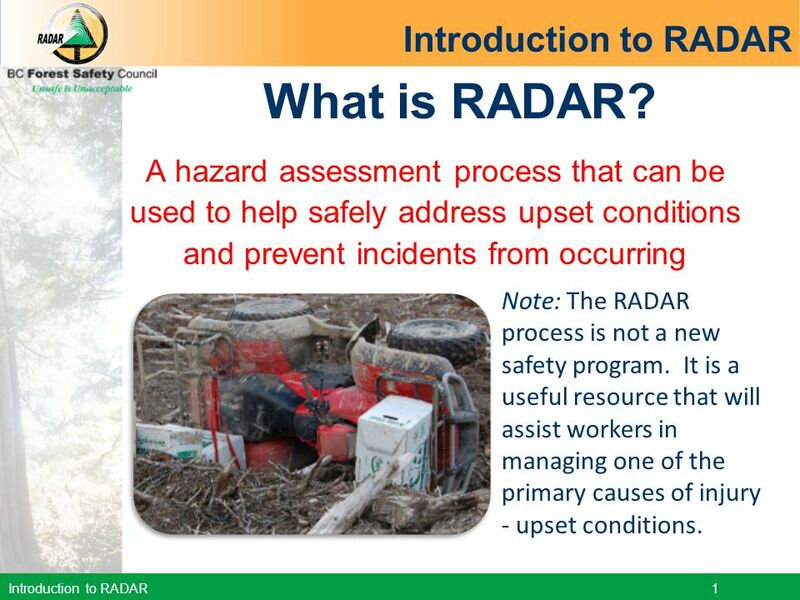 A hazard assessment process that can be used to help safely address upset conditions and prevent incidents from occurring Note: The RADAR process is not a new safety program. It is a useful resource that will assist workers in managing one of the primary causes of injury - upset conditions. 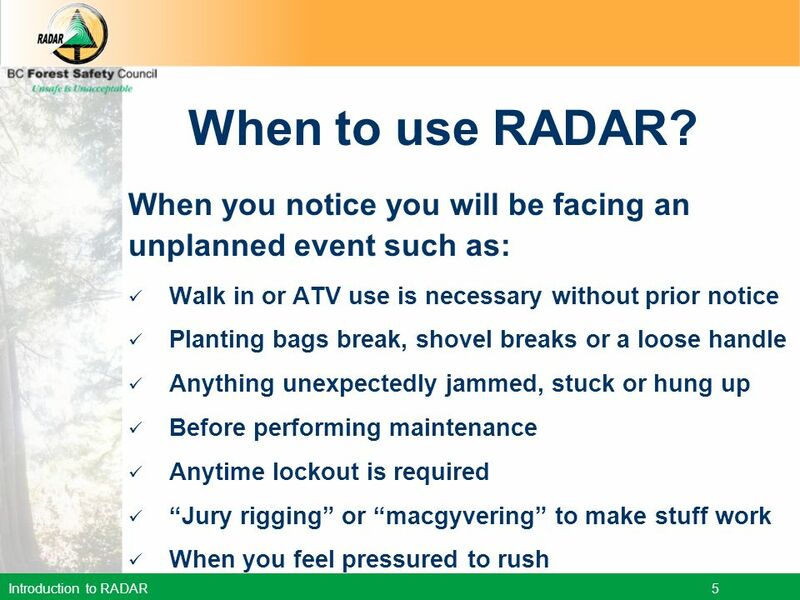 If you find yourself saying any of the following: This will be a quicker way to do it… It looks like it will hold (I’m sure it’s strong enough)…. This tool, equipment is not performing the way it should… I am getting tired of dealing with this over and over again! I know I could use some help but don’t want to ask for it… This will only take a second. 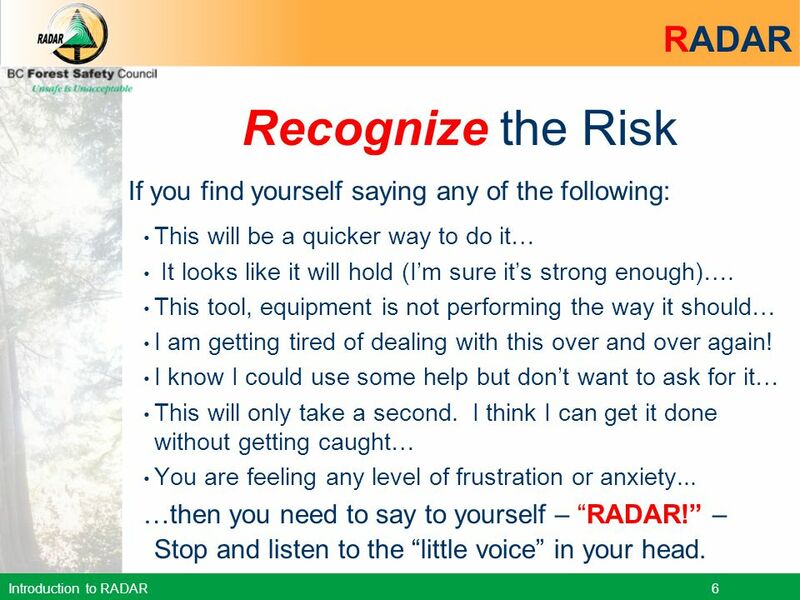 I think I can get it done without getting caught… You are feeling any level of frustration or anxiety... …then you need to say to yourself – “RADAR!” – Stop and listen to the “little voice” in your head. 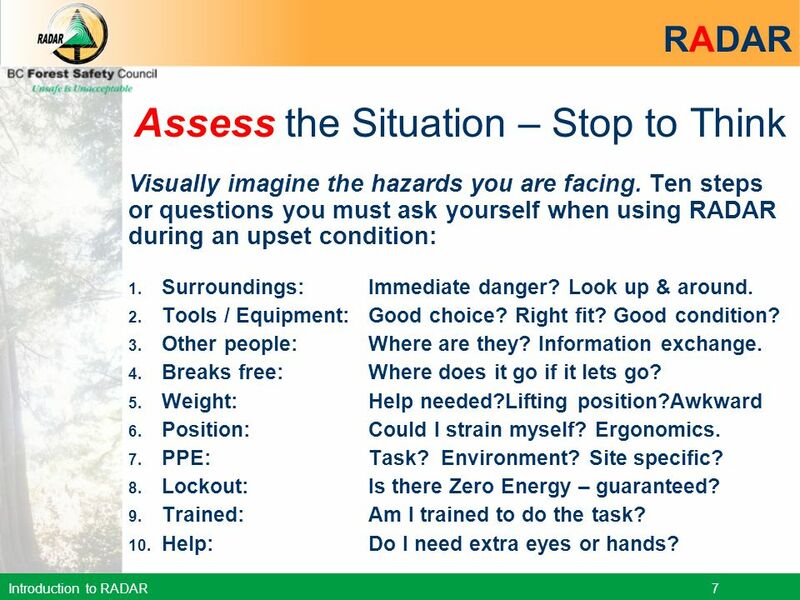 RADAR Assess the Situation – Stop to Think Visually imagine the hazards you are facing. 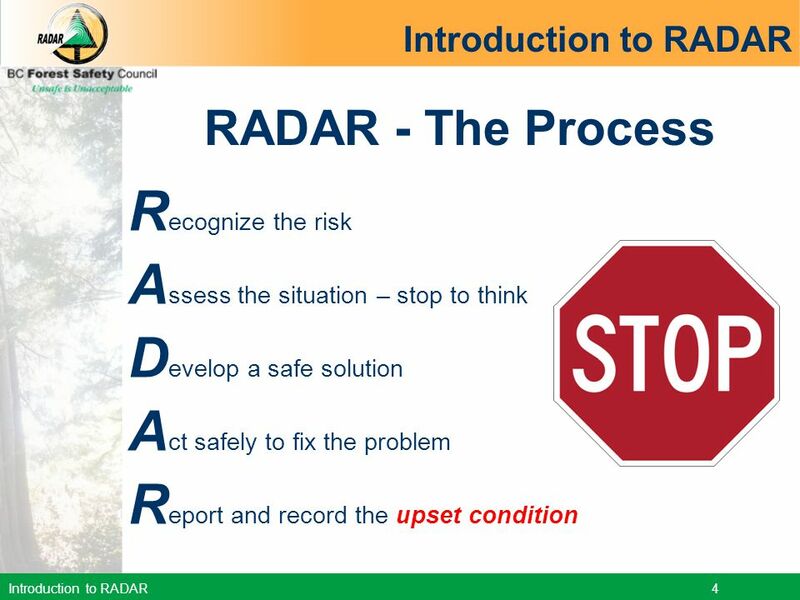 Ten steps or questions you must ask yourself when using RADAR during an upset condition: Surroundings:	Immediate danger? Look up & around. Tools / Equipment:	Good choice? Right fit? Good condition? Other people:	Where are they? Information exchange. Breaks free:	Where does it go if it lets go? 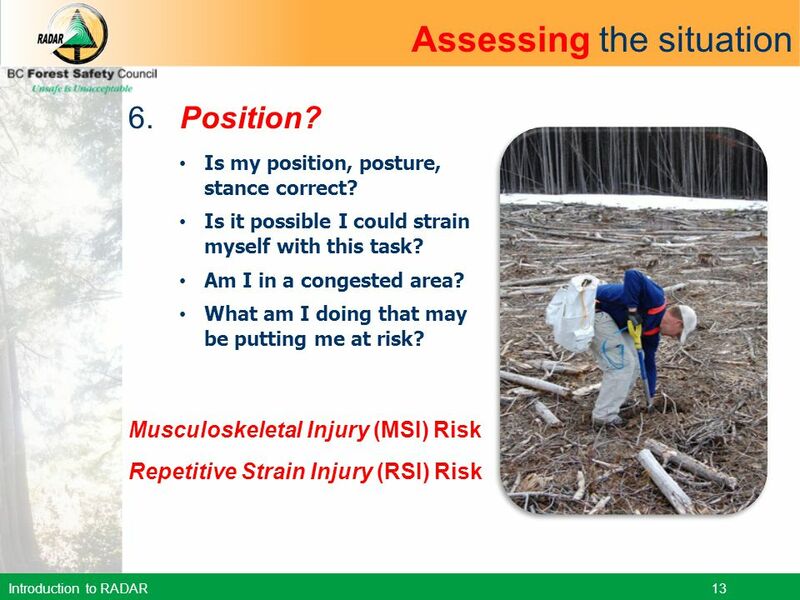 Weight:	Help needed?Lifting position?Awkward Position:	Could I strain myself? Ergonomics. 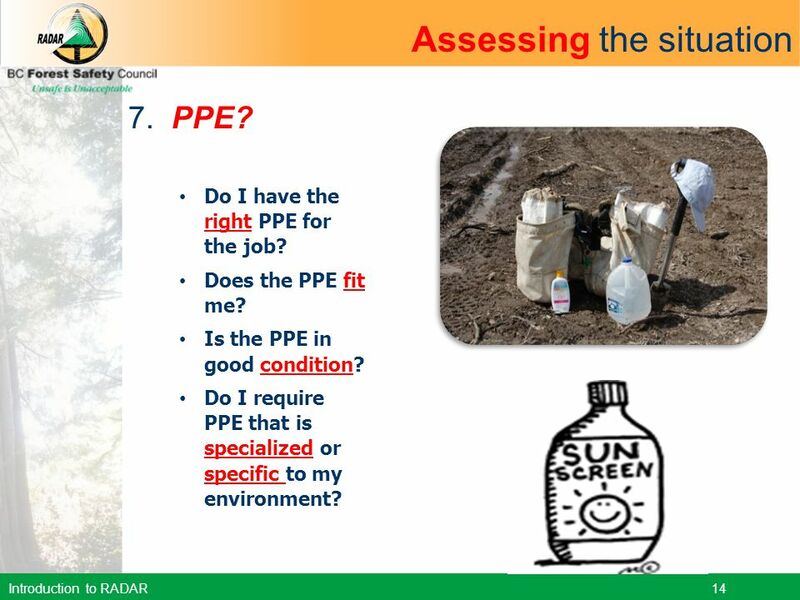 PPE:	Task? Environment? Site specific? 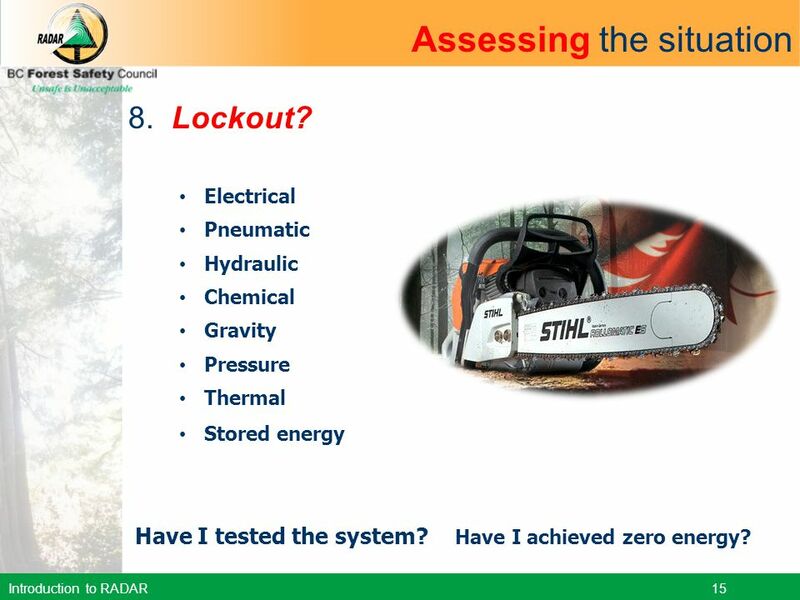 Lockout:	Is there Zero Energy – guaranteed? Trained:	Am I trained to do the task? Help:	Do I need extra eyes or hands? 1. 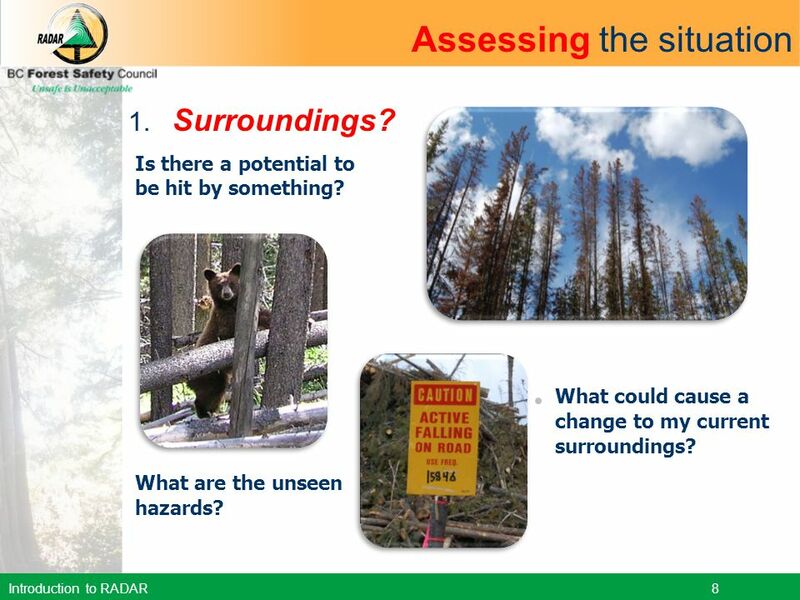 Surroundings? Is there a potential to be hit by something? What could cause a change to my current surroundings? 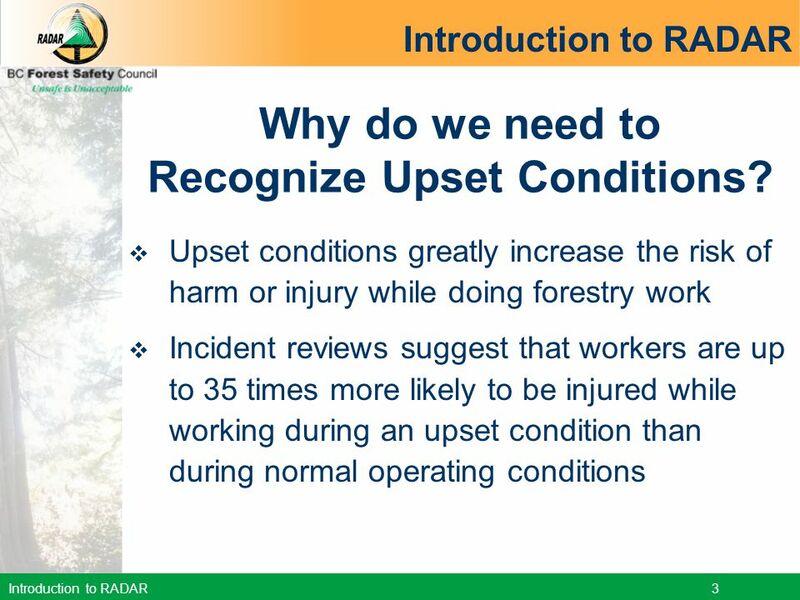 What are the unseen hazards? 2. Tools & Equipment? Do I have the right tool / equipment for the job? Do I know how to use it safely? 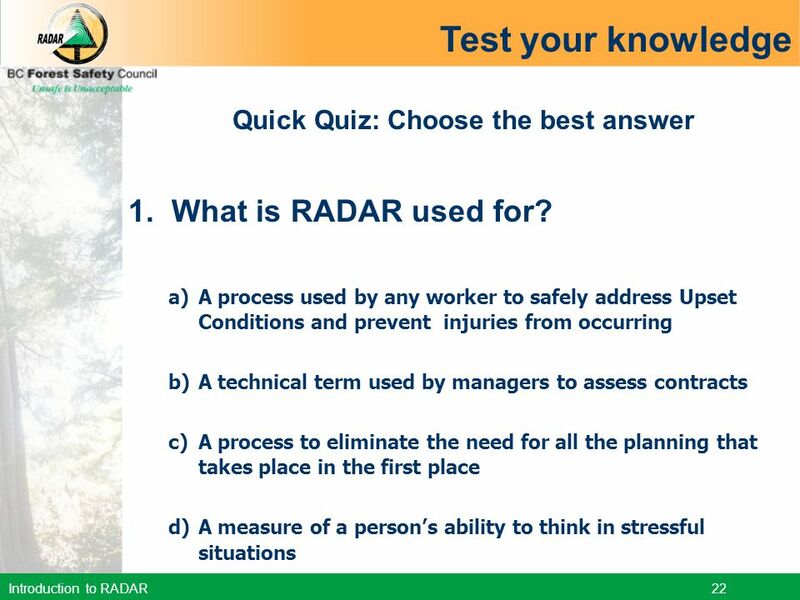 Am I trained / qualified? Is the tool in good shape, including sized properly and appropriately fit? Is the equipment in good condition? 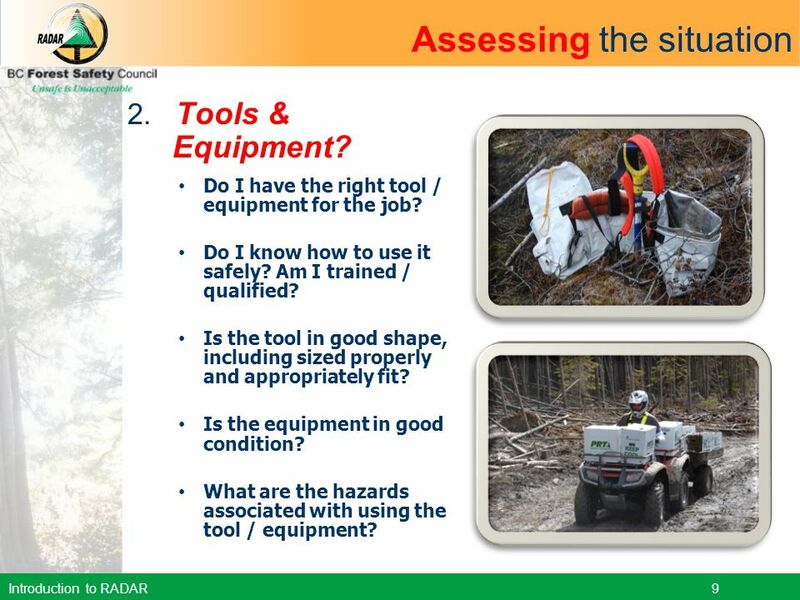 What are the hazards associated with using the tool / equipment? 3. Other people? Am I aware of where my co-workers are located? 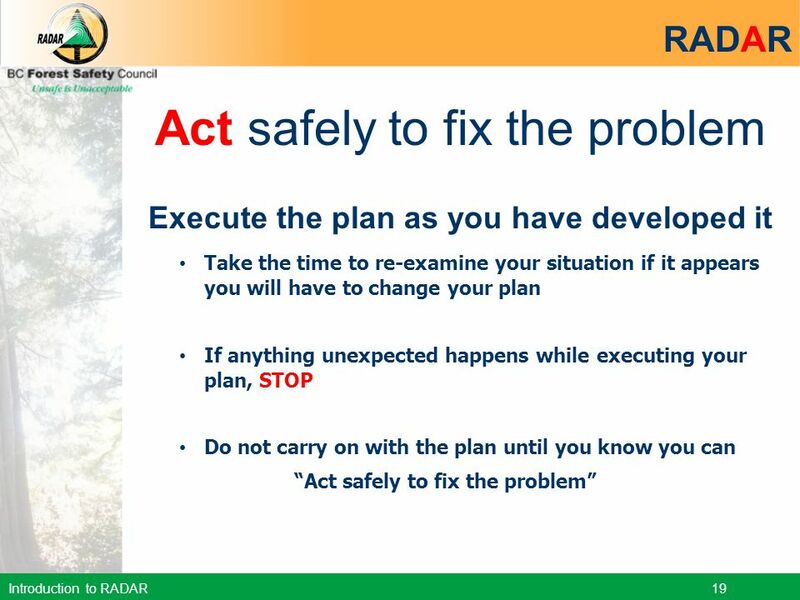 Are people alert to what I am doing? Is there good communication - have we talked it over together? 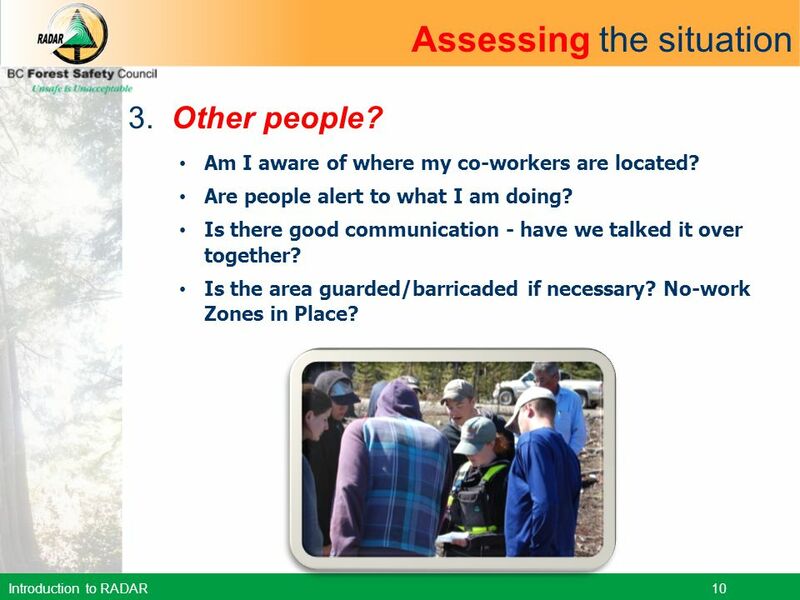 Is the area guarded/barricaded if necessary? No-work Zones in Place? 4. 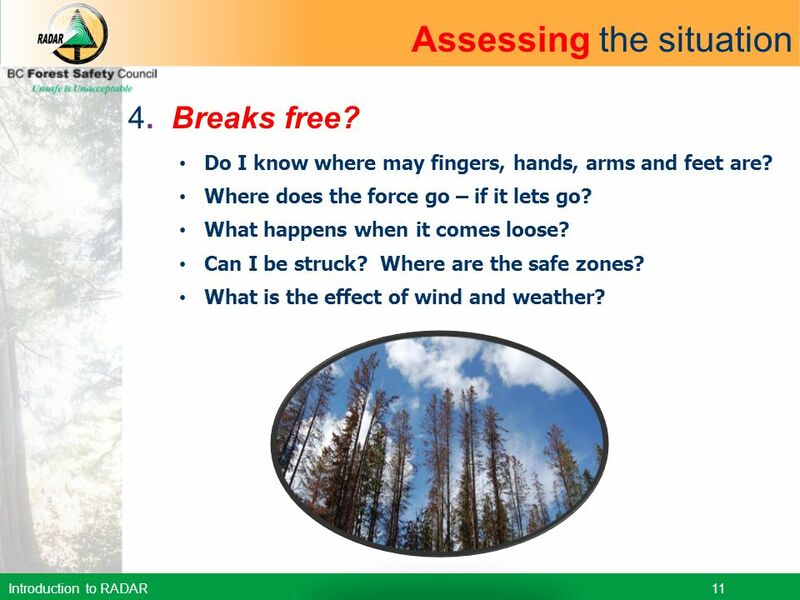 Breaks free? Do I know where may fingers, hands, arms and feet are? Where does the force go – if it lets go? What happens when it comes loose? Can I be struck? 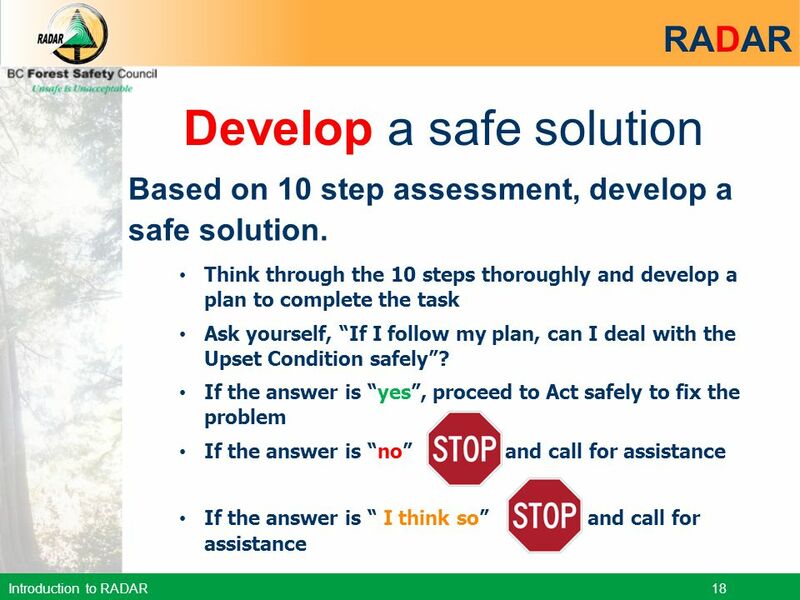 Where are the safe zones? 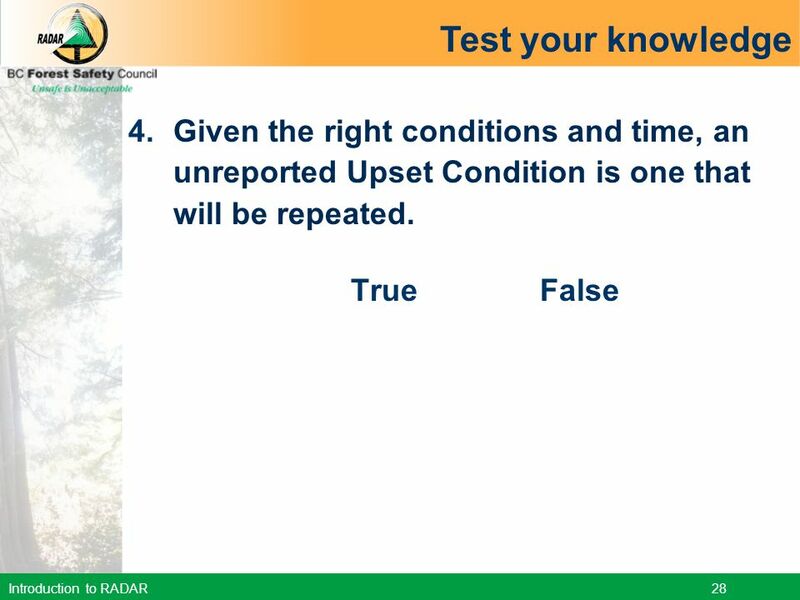 What is the effect of wind and weather? 5. Weight? Am I lifting properly? What’s my body position? 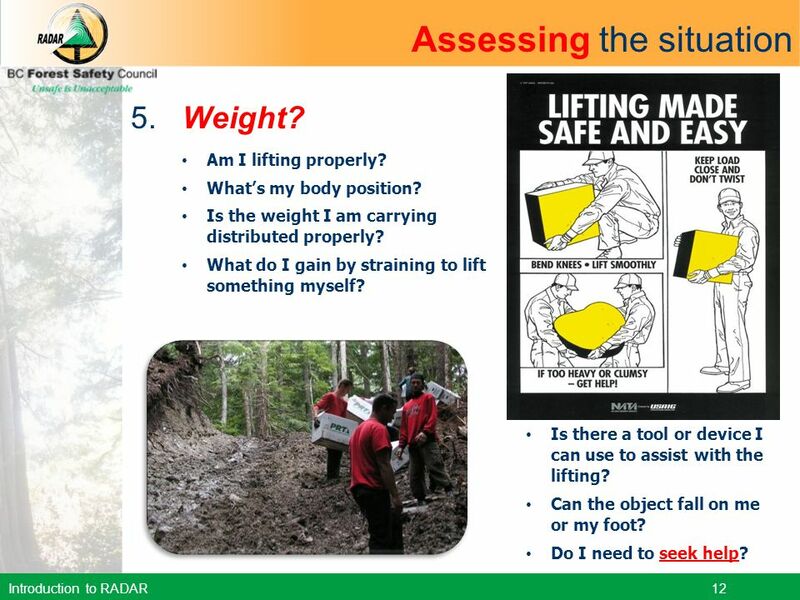 Is the weight I am carrying distributed properly? What do I gain by straining to lift something myself? Is there a tool or device I can use to assist with the lifting? Can the object fall on me or my foot? Do I need to seek help? 7. PPE? Do I have the right PPE for the job? Does the PPE fit me? Is the PPE in good condition? 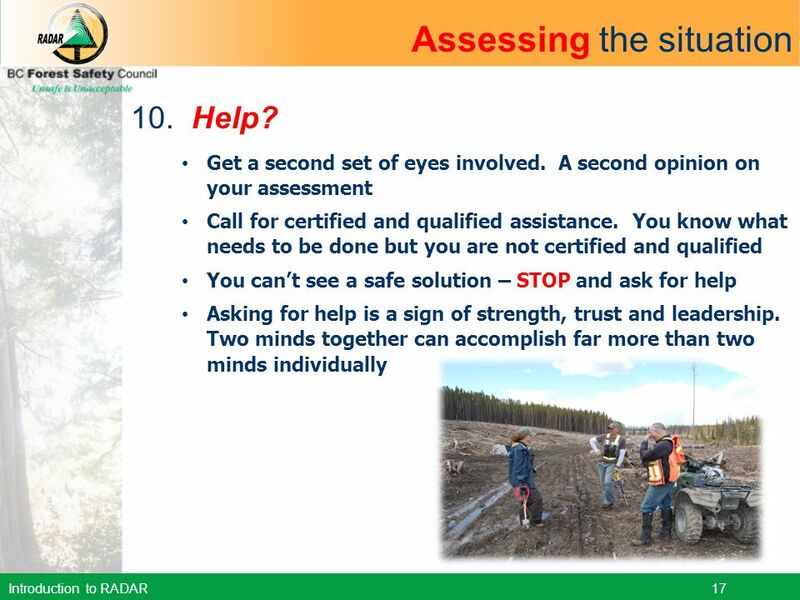 Do I require PPE that is specialized or specific to my environment? 8. Lockout? Electrical Pneumatic Hydraulic Chemical Gravity Pressure Thermal Stored energy Have I tested the system? Have I achieved zero energy? 9. Trained? 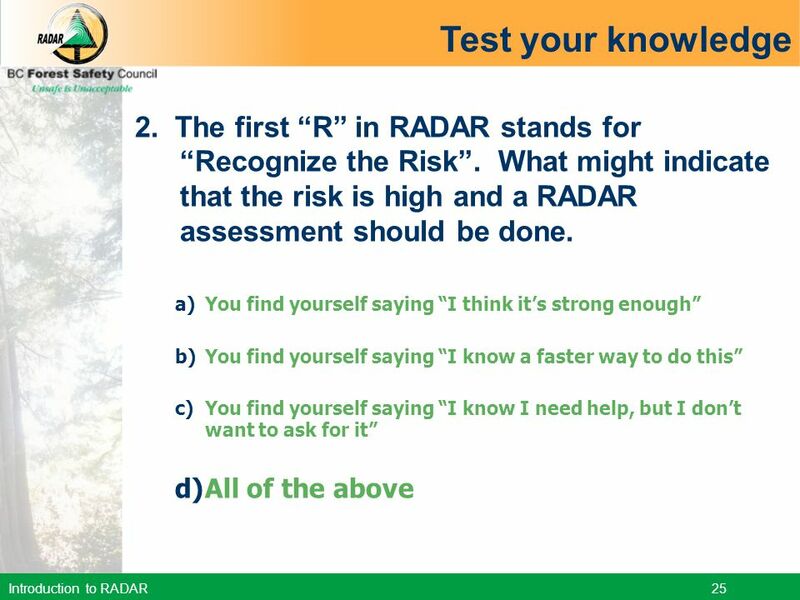 Have I been trained for what I am about to do? Have the people helping me been trained? Am I certified and qualified to perform the function I am about to do? 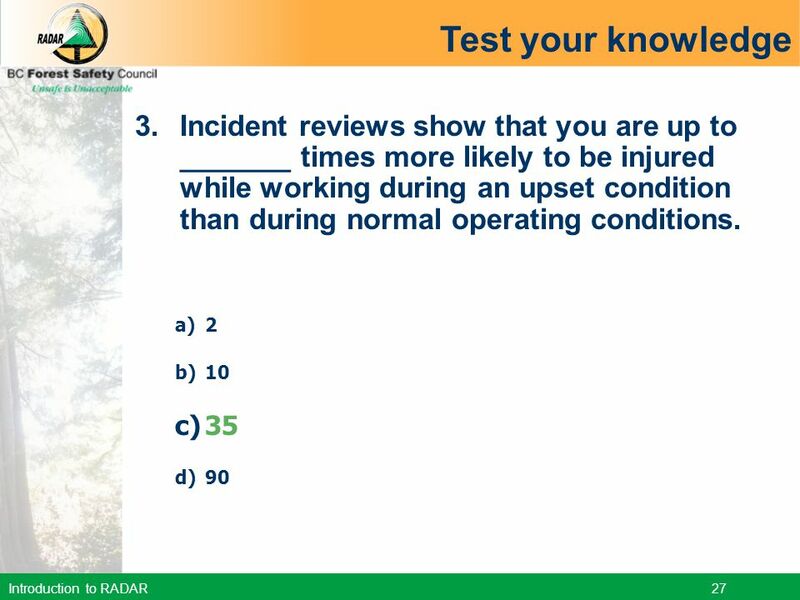 Am I familiar with the Safe Work Procedure for this task? 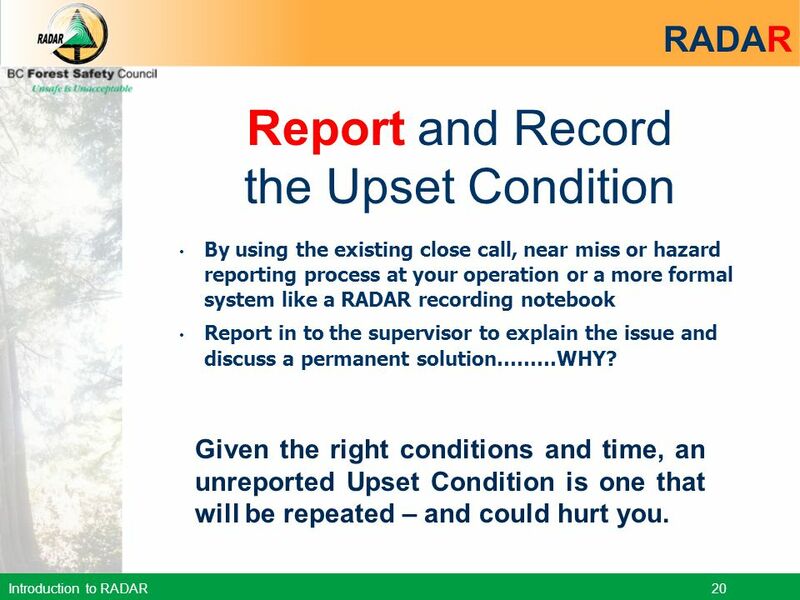 By using the existing close call, near miss or hazard reporting process at your operation or a more formal system like a RADAR recording notebook Report in to the supervisor to explain the issue and discuss a permanent solution………WHY? 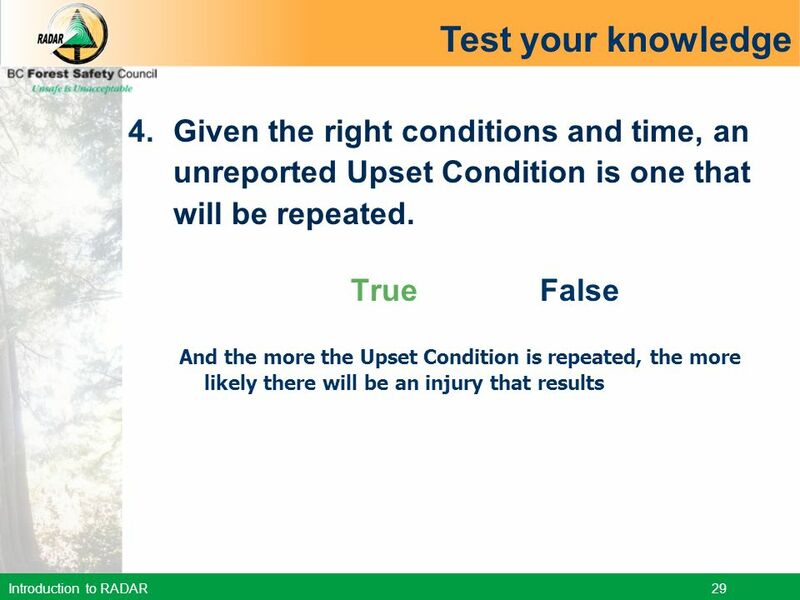 Given the right conditions and time, an unreported Upset Condition is one that will be repeated – and could hurt you. 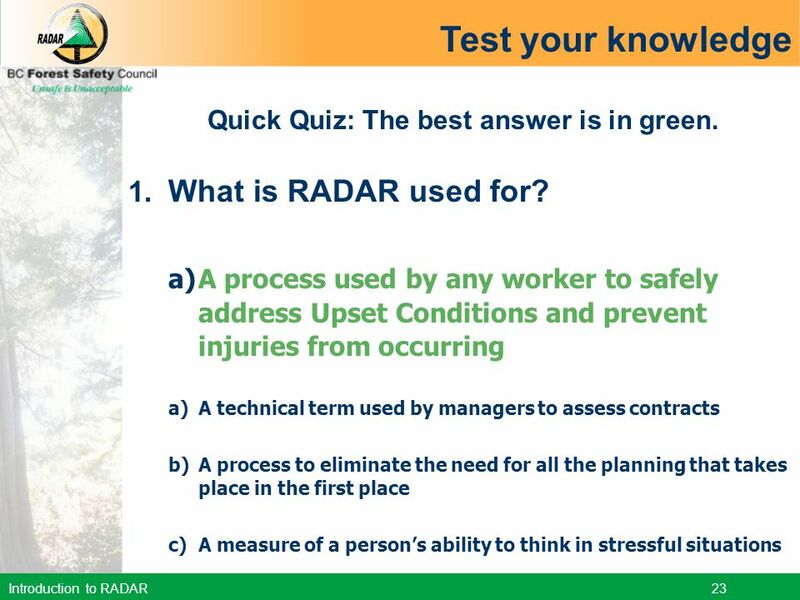 23 Quick Quiz: The best answer is in green. 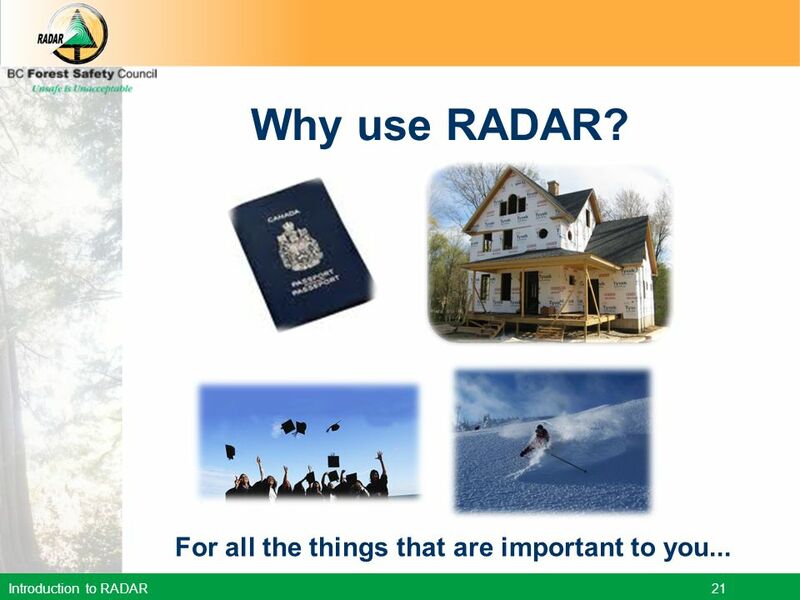 Download ppt "What is RADAR? 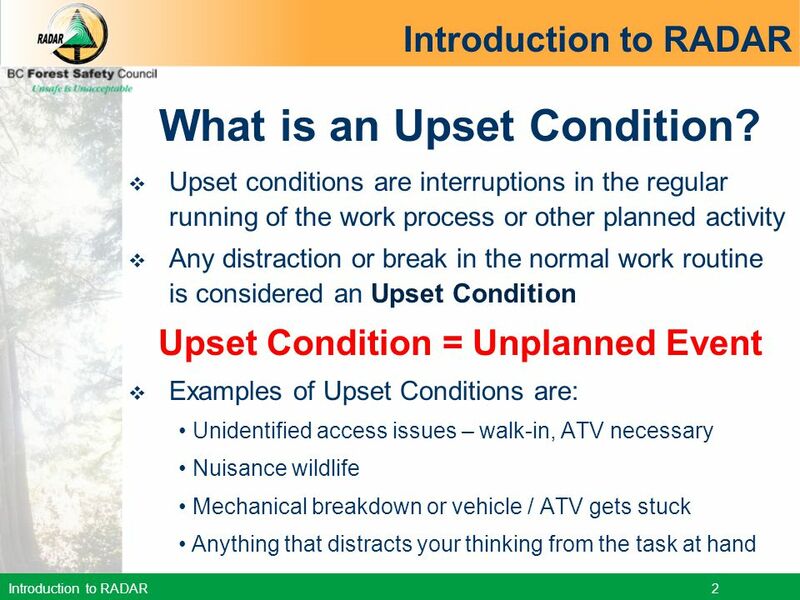 Introduction to RADAR"
BC Forest Safety Council Unsafe is Unacceptable RADAR - In the Clear Avoid the Bight: Stay "In the Clear" In The Clear.